This is the moment of truth for the Military Justice Improvement Act (MJIA) -- we know a vote is imminent. Show your support for this vital legislation by sharing our Facebook graphic. Commanding officers shouldn’t be able to decide if an assailant ever sees the inside of a courtroom. Prosecution of sexual assault must be taken out of the hands of commanders -- which is exactly what the MJIA would do. Of the 26,000 incidents estimated for 2012, only 3,374 sexual assaults were officially reported. Just 302 cases were prosecuted, with only 238 cases leading to conviction. That's only 7 percent! Survivors - both women and men - say that they fear retaliation and do not believe that their complaints will be taken seriously. 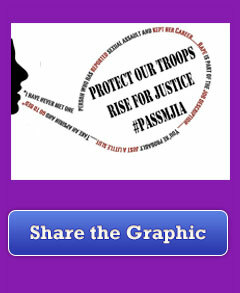 Help us make this graphic go viral and show that we stand united behind victims of military sexual violence. It is clear that the current system of military "justice" does not work and must be changed. Survivors deserve prosecutors who specialize in these crimes and are independent from chain of command constraints. P.S. Not on Facebook or want to do more? You can show your support for MJIA by emailing your Senators and asking them to vote for the bill (or thank them for their support)! Will you join us in June for the NOW Women of Color & Allies conference?